Yeh Khula Aasman is preachy and predictable, writes Preeti Arora. Over the last few years, we have had two really successful sports films Iqbal and Chak! De India. So there was the fervent hope that directors and screenplay writers would make the effort and give us sweet feel-good movies where our protagonist would use both his mind and muscles to overcome all odds, where the underdog would one day triumph and take the trophy home. The sport could be cricket, hockey or kabbadi as long as they could tell us the story convincingly, give us characters that we could cheer for. But that optimism vanishes in the first five minutes of Yeh Khula Aasman. And one can predict the grand finale. But debutante director Gitanjali Sinha believes in telling her story at a torturous pace. Yeh Khula Aasmaan was touted as a sports film which it isn't. The most appropriate description which comes to mind is contrived melodrama that has random plot points strung together. If the characters seem trite and clichéd, you need to hold on for a second till you catch a glimpse of the 'moral values' crammed into the 100-odd minutes (the duration of the film). The film gets preachy at this point. is in a bit of a dilemma. He hasn't managed to clear the IIT entrance exam. His parents live in London but he has been on his own in Mumbai. On an impulse, he decides to visit his ailing grandfather (Raghuvir Yadav). Seeing the old man's joy Avinash decides to stay on for a few days. 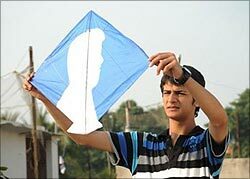 Avinash realizes his grandfather won the kite-flying championship when he was a young man. And his skills are revered and appreciated to this day. He is of the opinion that Avinash's father was a coward who went to London to become a rich man when he should have stayed back in the village and become the kite-flying champion. And now the 'family honor' is in Avinash's hands. Raj Tandon shows some promise but his performance gets bogged down by the synthetic dialogues he's forced to deliver every few minutes. The girl next door Muskaan (played by Anya Anand) struts around with a vacuous expression on her face. Fairly confident for a newcomer, she can't really be blamed if the director has focused more on the vague symbolism of the kites than on the characters? The kite-flying competition turns into the most tedious part of the film where tight close-ups of the competitors with strained gestures and highly contorted faces are intercut with kites floating in the sky. And when a film of this genre can't create a few terse moments of suspense for climax then it can only generate yawn-inducing moments. There is only one reason to see this film. It will definitely be a long long time before you tell somebody, "Oh, go fly a kite"